There are always large rooms in this world, right? Maybe they are one or two large rooms in your home, a 5-star level Hotel room, or even a meeting hall. A large room covers a huge amount of air which can be very polluted. Here are the reasons you are looking for the best large room air purifiers for your needs. You found out that your air purifier is insufficient for your large room (over 300 or 500 sq ft) or kind of useless. You had a large room with lots of people (meeting halls, restaurants, hospitals) and you need a real large room air purifier to meet everyone’s demand. We do not (in fact, we never) exaggerate one product just to let you click the links and buy that product blindly. Air purifiers are for everyone. 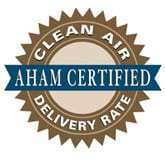 Believing that, we will give you the best air purifiers in all price range. To know the exact price of your air purifier, make sure to hit the Check price button. Important Note: If you have a small room, we highly recommend you to read our list of the best small and quiet air purifiers in 2019. A large room over 300 and even 500 sq ft is a huge space of airflow. To inhale and exhale such a large amount of air, an air purifier needs lots of fan power. And therefore, you can’t expect a cheap air purifier to do such a difficult task for you. We will bring you the top 7 most powerful large room air purifiers and 3 most affordable large room air purifiers in 2019. UPDATED: We have updated our list of best large room air purifiers in 02/27/2019. In Breathe Quality, we keep updating our posts whenever possible, and this update is the result of a 3-month consecutive experiment in our labs, so we can make sure that you will get the right air purifier for your large rooms. Our next update will be set for 3-6 months later, depending on the release of new products from the well-known air purifier brands. However, you don’t need to wait, because the air purifier market will never change so quickly. It’s time to dive into the best large room air purifiers. This Comparison Table of the best large room air purifiers in 2019 will help you have a quick overview of our list. The factor for comparison in this table is Filter Type of this air purifier, also we give the most concerned factors as Room Capability (of course you need it for your large room over 500 sq ft), and a shortcut to their True HEPA Filter replacements (HEPA Filter needs to be replaced after 6 months to 1 year). Remember that you should check the reviews of the air purifiers in this comparison table. Just check the factors won’t help you know why we put these 10 devices as the best large room air purifiers in 2019. Previously in our list: IQAir GC MultiGas. IQAir is a true giant in air purifier industry, the only to claim as the World’s Best HEPA Air purifier, with the foundation to be 50 years ago. This brand is only dedicated to bring out the luxury high-range air purifiers. IQAir GC MultiGas is currently the most powerful air purifier for large room. So why Breathe Quality gave the gold medal to IQAir GC MultiGas? First of all, IQAir GC MultiGas fits perfect for a large room. This air purifier can effectively cover an area of up to 1125 sq ft. Most importantly, IQAir GC MultiGas features a powerful New Edition fan. With this new technology, GC MultiGas can have a Clean Air Delivery Rate (CADR) of 776 cfm. To top up with this high CADR, IQAir GC MultiGas loads 5x air changes per hour (ACH). HyperHEPA filter – You will have a powerful HyperHEPA H11 pre-filter. This True HEPA filter is effectively capture 99% of particles down to 0.3 microns, and 95% of particles as small as 0.003 microns. Cartridge-based activated carbon filter – This filter can remove VOCs and odors effectively because it is made with the highest quality ABS plastics. Cartridge-based chemisorption – This stage destroys harmful chemicals, such as formaldehyde by an oxidation process. Any kinds of smoke or VOCs pass through these two cartridge-based filter will be absorbed completely. Post-filter sleeve – A post-filter sleeve wraps each gas cartridge to prevent media dust from being released back to the air. IQAir GC MultiGas is well-built with highest quality materials, so you should not worry to much. The IQAir unique 3D UltraSeal no-leakage design will prevent air from escaping back into the room without being drawn through the GC MultiGas filters. Review: IQAir GC MultiGas Review. The IQAir GC MultiGas is mostly for dealing with the smoke, odors, VOCs, formaldehyde and other chemicals. If you have worried about the typical dust, dust mites, pollen or pet dander, you should look for the IQAir HealthPro Plus. 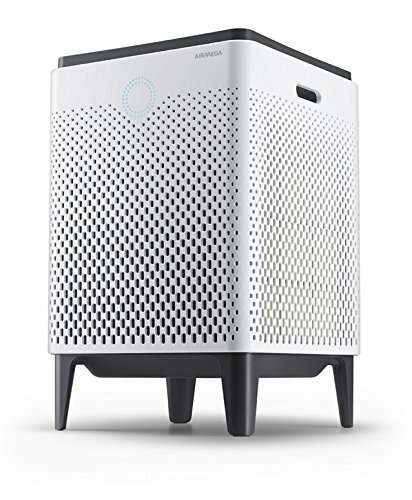 This air purifier is $400 cheaper than its GC MultiGas brother, while upgrading the HyperHEPA from H11 to H13. That being said, IQAir HealthPro Plus can deal with even 99.97% of any ultra-fine particles as small as 0.3 microns, and 95% of particles as small as 0.003 microns. We believe this is the best HEPA filter at the moment. 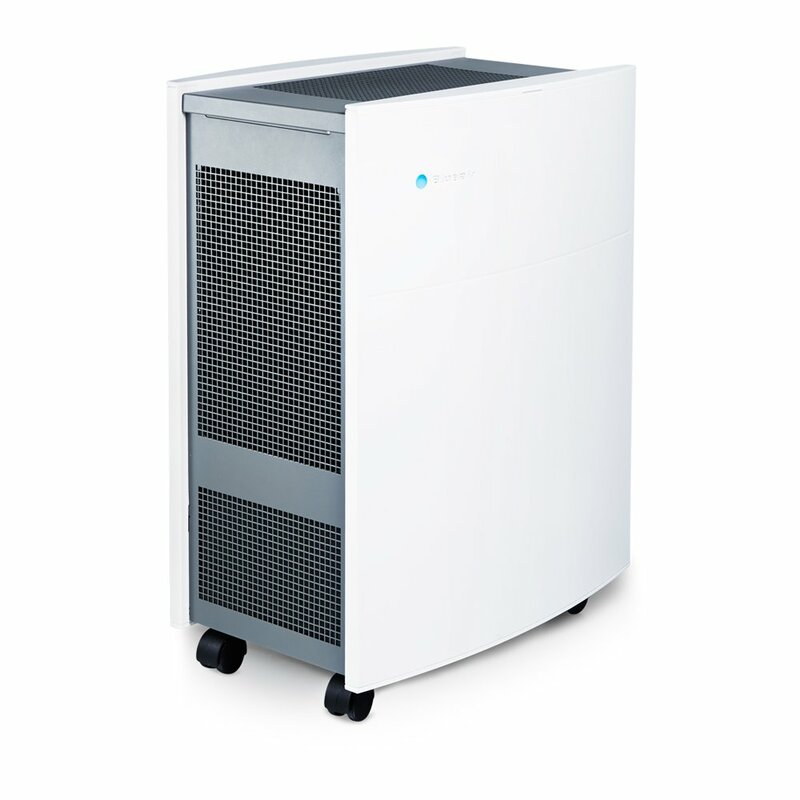 Blueair is also a well-known brand in air purifier market for about 20 years. 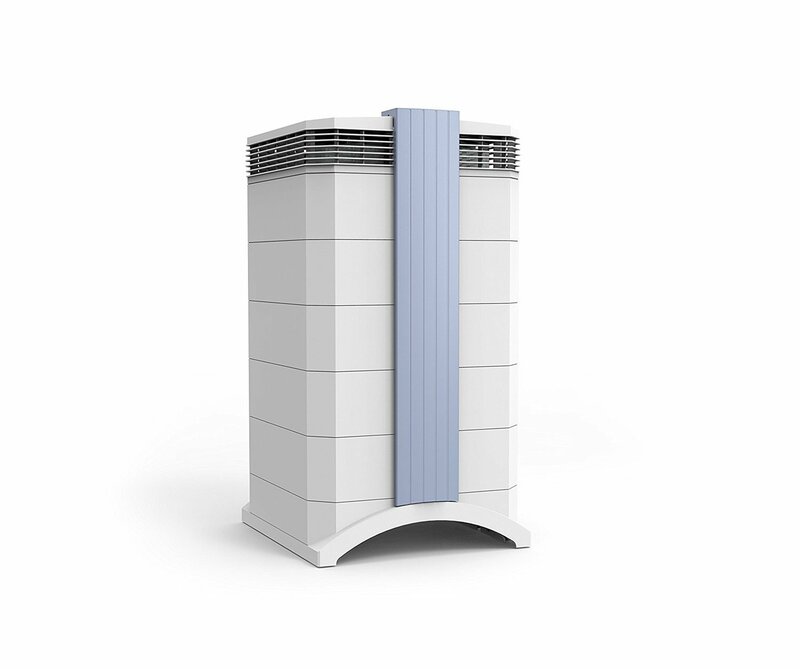 After many years of honing their experience, it is safe to say Blueair is a safe option for air purifiers, especially when it comes to a big air purifier machine for large room. As the runners-up of best large room air purifiers list, Blueair Pro XL can cover an extra large room of 1180 sq ft.
Blueair’s fan power is matchless, especially in their proud highest capacity air purifier. With a high CADR of 950 Dust/ 800 Smoke/ 900 Pollen (cfm) and 5X ACH, Blueair Pro XL is currently the highest CADR air purifier in the world. 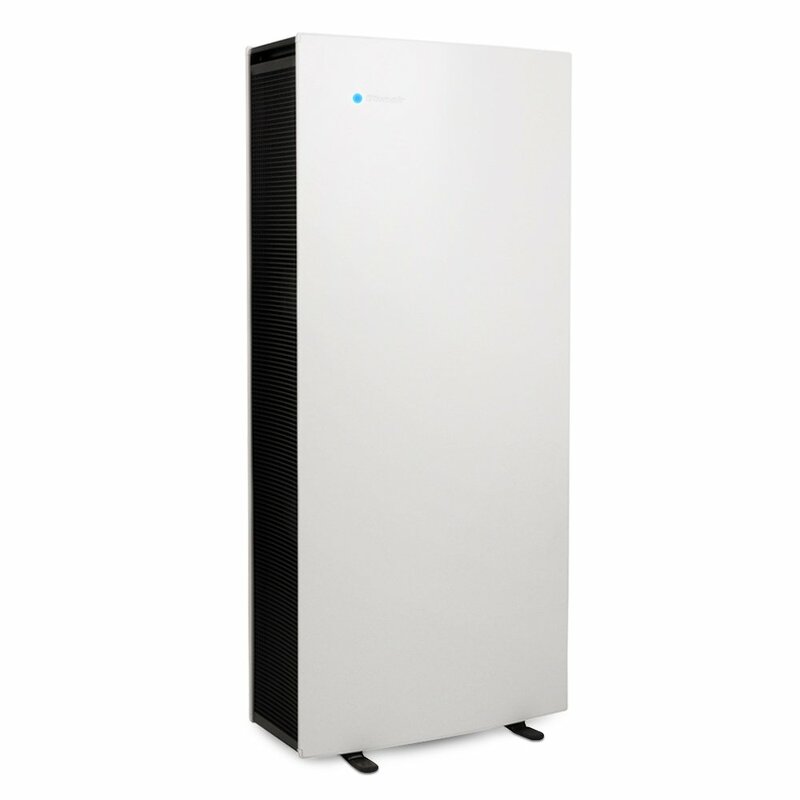 In terms of power, Blueair Pro XL is also impressive with two options of air filtration. As a tradition, if you buy one product from Blueair, there is no need to remember what are the filter types, because Blueair will always combine them into one for better installation. Particle Filter/ SmokeStop Filter – Choose between the 2 filter selections. Should it be the Particle Filter, the optimal choice for removing particle pollutants such as bacteria, viruses, pet dander, dust and pollen. Or Blueair SmokeStop Filter to get rid of gaseous pollutants, for example Volatile Organic Compounds (VOCs, such as formaldehyde), tobacco smoke and particles. Carbon+ Filter – To add an extra protection against gaseous pollutants. With a top notch performance rating and a superior style, we should add Blueair Pro XL as the champion of this list. However, this list is based on performance/value. And no matter how impressive the performance of Blueair Pro XL is, Breathe Quality only can put this air purifier up as a runners-up. 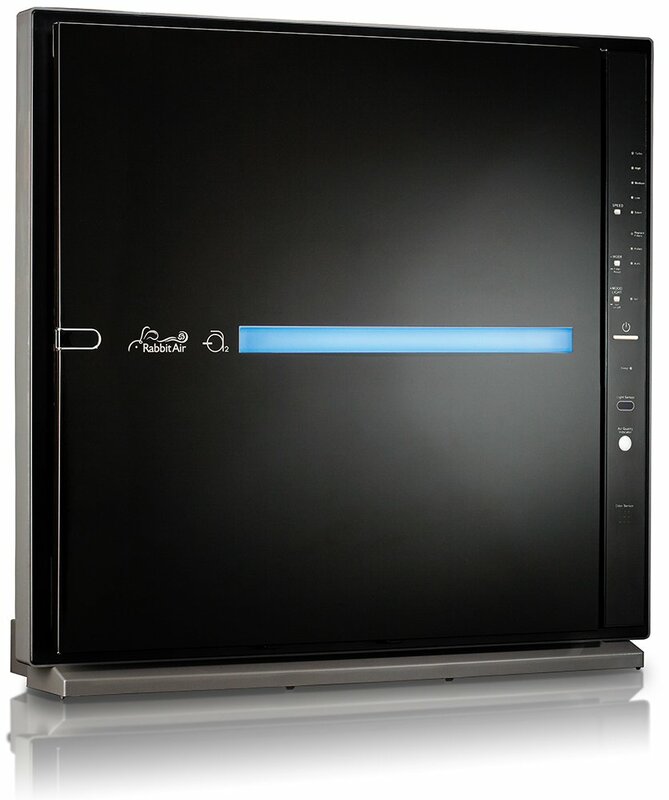 Review: Blueair Pro XL Review. If you prefer the classic design style, you can switch to the Blueair Classic 605. This air purifier used to stay high in our best large room air purifiers list because of the top-notch performance/value this device can bring to the users. 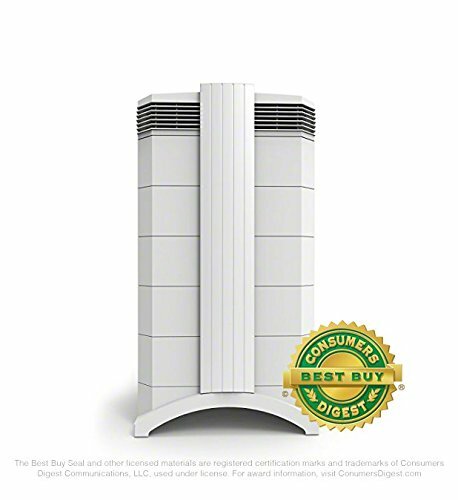 Although the room coverage is only 775 sq ft, there is no doubt that Blueair Classic 605 is one of the best air purifiers for large rooms, with CADR rating of 500 Dust/ 500 Smoke/ 640 Pollen (cfm) and an amazing 5X ACH. If you are aiming at the real deal of high-range air purifier, you can’t miss the Oransi brand. 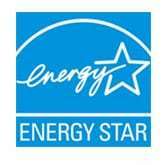 Their air purifiers are featured in lots of trustworthy media such as CNN or CNBC. Their latest flagship – the Oransi Erik 650A is the ultimate defense against polluted air in large rooms. As the third place in our best large room air purifiers list, Oransi Erik 650A is capable of covering of 1700 sq ft. The fan power of this Oransi Erik 650A is unchallenged one of the best with the top-notch 413 cfm of CADR rating. Along with such high CADR, this air purifier will clean your room as often as 5 times per hour. All the pollutants in your large room will be removed completely in a matter of minutes. Not only has an excellent fan power, the Oransi Erik 650A invents a high-quality air filtration system which passed many rigorous tests to meet the requirements. Pre-filter – A 4-inch deep GAC impregnated Activated Carbon/potassium pre-filter. This is one of the best pre-filter system we have ever seen. The pre-filter can capture 85% of contaminant particles down to 0.3 microns before it could meet the powerful True HEPA filter. True HEPA Filter – A 12-inch deep main HEPA filter which can remove 99.99% of all particles as small as 0.3 microns. Oransi Erik 650A makes use of an advanced True HEPA filter, with more filter media to help it last longer (more than 2 years) and create less resistance. As a result, the Oransi Erik 650A doesn’t need such high CADR fan power as Blueair Pro XL or Blueair Classic 605, thus operating much quieter. Review: Oransi Erik 650A Review. 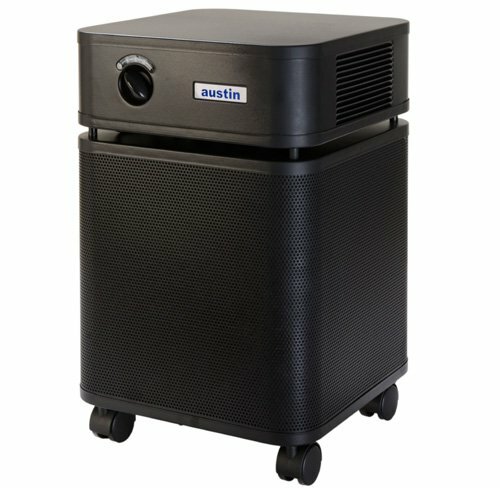 With the title of “The only Clinically Proven, Medical Grade Air Purifier”, Austin Air is always the first priority when considering a best large room air purifier. If you could afford a high-range budget machine, Austin Air is the brand mentioning the most in 2019. Their Austin Air HealthMate Plus is notable for large room coverage of 1500 sq ft.
We can easily measure the fan power of this Austin Air flagship with a 5X ACH and 400 cfm CADR. This fan power is still extremely powerful for an air purifier, being double the CADR of the best low-range air purifiers like Coway AP-1512HH or Winix WAC9500. One advantage for Austin Air HealthMate Plus is their medical grade 4-stage filter. Medium Particle Pre-filter – Just like Rabbit Air MinusA2, Austin Air HealthMate Plus can remove molds, spores and pollen from this pre-filter. Activated Carbon filter – A 15-lb Activated Carbon, Potassium Iodide Impregnated Carbon and Zeolite to help remove VOCs, formaldehyde, benzenes, chemicals, gases and odors. True HEPA filter – With twice the pre-filter, the True HEPA filter will only need to capture the tiniest particles. Using a Medical Grade 60-square-ft True HEPA filter, Austin Air Healthmate Plus is a real deal to any contaminant problems in your large room. The sound of this Austin Air HealthMate Plus is little at lowest setting, but is incredibly high at highest setting. It is recommended to run this air purifier at low setting more often. As the current flagship in 2019 of Coway, we expect much from AIRMEGA 400S. Indeed, this air purifier still mark the impressive performance and features. For a large room air purifier, AIRMEGA 400S can cover up to 1560 sq ft. The CADR is not included in this AIRMEGA’s manual, but through many deep tests, Breathe Quality recorded an underrated CADR of 340 Dust/ 350 Smoke/ 400 Pollen. This CADR specs is quite not sufficient for a large room coverage of 1560 sq ft.
Pre-filter – A powerful washable pre-filter is available to help you capture large objects of contaminants. Max2 filter – A combination of both Activated Carbon Filter and True HEPA filter, this filter can both capture up to 99.97% of airborne particles 0.3 microns and reduce more than 99 percent of volatile organic compounds and reduces fumes such as NH3 and CH3CHO. With Smart Enabled Feature, AIRMEGA 400S is also the top rated smart air purifier at the moment. This brand has an unique Eco Mode to change the fan speed depending on the air quality, and therefore save the energy. 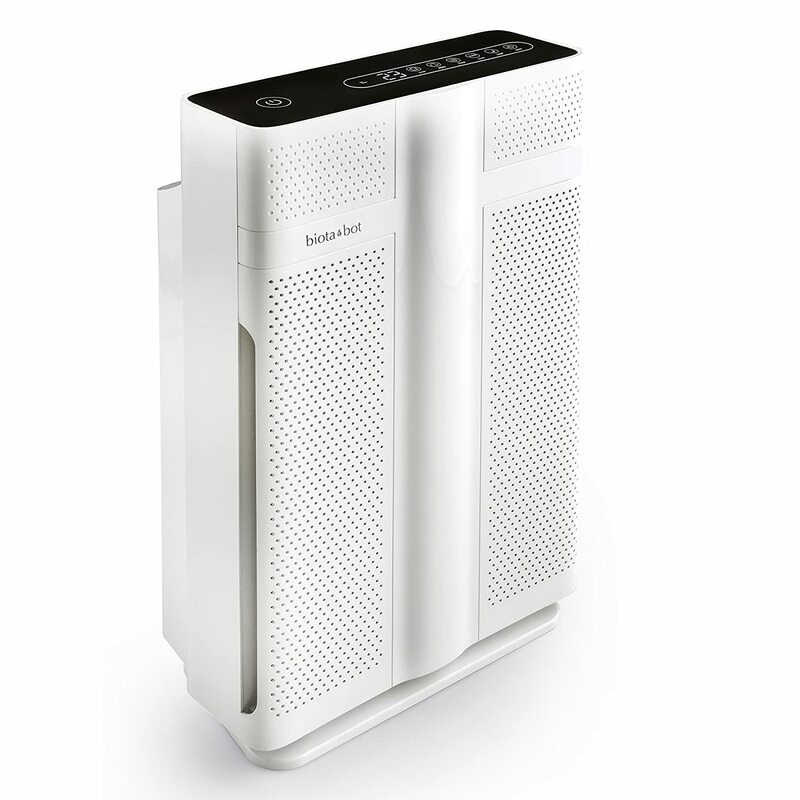 As a mid-range air purifier, Rabbit Air MinusA2 will need to take more effort to be the best large room air purifier. With up to 815 sq ft in coverage, the winner in Breathe Quality best air purifiers in 2019 is a qualified candidate, but can not compete with the top three. Rabbit Air invent a impressive technology for their fan. However, the innovation is not to increase the fan power. That’s why Rabbit Air MinusA2 only have a CADR of 193 Dust/ 180 Smoke/ 200 Pollen and a maximum of 4X ACH. Pre-filter – The polluted air must pass through a pre-filter, there it will capture all large particles, along with dust mites and some of pet hair. Medium Filter – Traps large pollen, pet dander, mold and dust particles that is small enough to bypass the Pre-filter. Advanced BioGS HEPA Filter – It is a True HEPA Filter that captures 99.97% of all allergens, virus particles, pollen, mold and fungi particles down to 0.3 microns. Rabbit Air advances their air filter process, therefore prolong optimal filter efficiency and filter life of their HEPA Filter. Customized Filter – Double the protection with a variety of customized filters for specific needs like Germ Defense, Pet Allergy, Odor Remover, or Toxin Absorber. Activated Carbon Filter – Eliminates odors, smokes and chemical vapors. Ion Generator – The last line of defense is an ionizer to capture even the tiniest particles of pollutant and trap them into other filters. Can be switched on/off. In terms of performance rating, Rabbit Air MinusA2 will not lose to any brands. But with such low fan speed, this air purifier takes at least 4-5 times to clean a large room compared with the top three. We love the Smart features in Rabbit Air MinusA2, and the fact that this air purifier is ultra quiet makes MinusA2 a better option for large bedroom. Previously in our list: Alen BreatheSmart. Alen is the first and the best air purifier brand that delivers a Forever Warranty – a policy to guarantee the rights of their customers, as well as show the absolute confidence in their products. After many years of manufacturing the HEPA-type devices, finally we have a True HEPA flagship from Alen – the Alen BreatheSmart 75i. With a coverage of 1300 sq ft, Alen BreatheSmart 75i is the best air purifier for large rooms from this company. Also, the fan power is strongly improved from the predecessor, as Alen BreatheSmart 75i has a CADR rating of 347 cfm, and can exchange the air 5 times per hour. Now, Alen BreatheSmart 75i can boast about its powerful 3-stage air cleaning system, with the core of a great True HEPA filter. In addition, the Alen BreatheSmart 75i still combines its mechanical filters with the ionizer to push the limit of trapping 99.97% of allergens as small as 0.3 microns. You can select one from the 4 different True HEPA filters, depending on your demand. This air purifier is extremely quiet thanks to WhisperMax technology, to generate pink noise to guarantee a peaceful sleep. No one could deny the importance of sleep, right? That’s why this is also one best air purifier for large bedrooms. Previously in our list: Levoit LV-H133. The 2019 air purifier from Levoit proves that this brand can really make the air purifiers targeting large room (over than 500 sq ft). 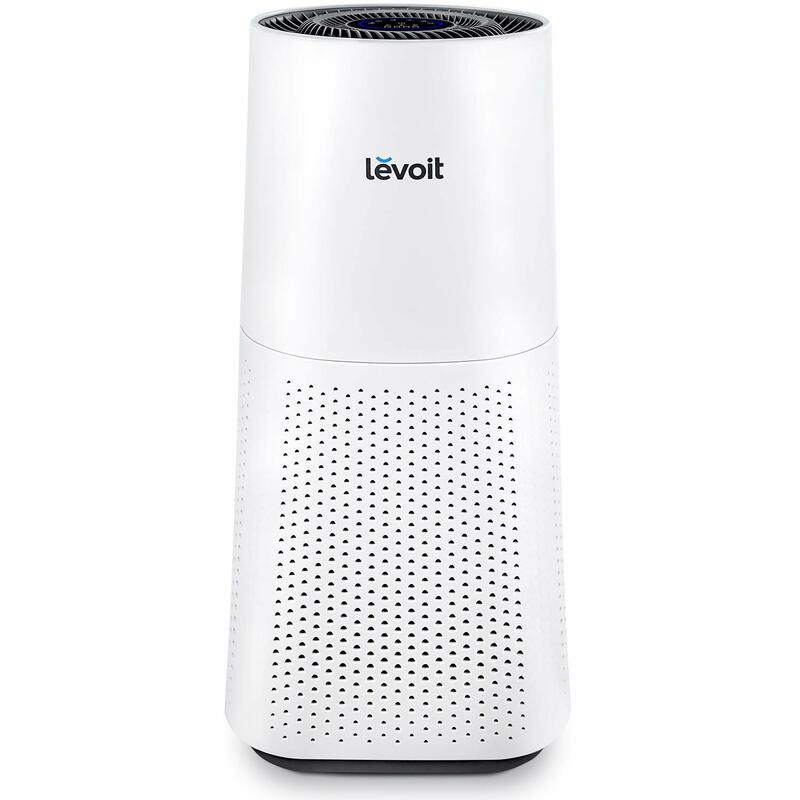 In the most affordable list of best large room air purifiers, we have a $400 Levoit LV-H134 with a room coverage of 710 sq ft, larger than the previous Levoit LV-H133. This air purifier upgrades to a CADR of 235 cfm from the previous 135 cfm of Levoit LV-PUR131. We believe that this improvement for fan power will make Levoit LV-H134 one of the top-notch performers in this low-range segment. Pre-filter – This nylon pre-filter can capture airborne large objects like dust, pet dander, pet hair, lint and fiber. This pre-filter is mostly for maximizing the True HEPA filter life. Using a new technology, Levoit LV-H134 is more stable and more silent than even the air purifier for bedroom LV-H132. Also, this air purifier is one of the lowest energy-consuming air purifiers. Previously in our list: Biota Bot MM608I. 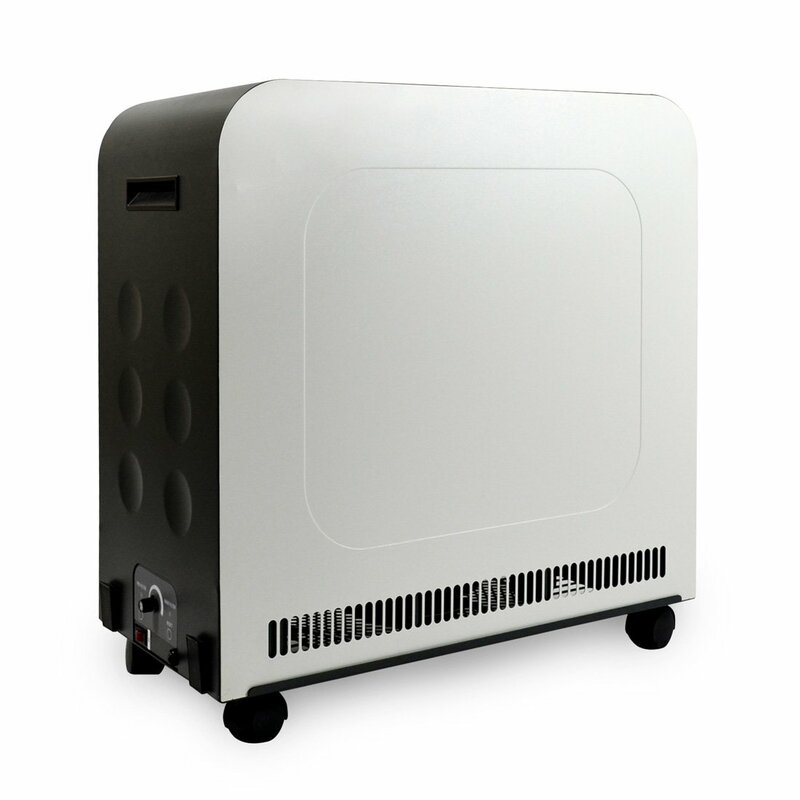 Biota Bot MM608I is the latest product of the great US air purifier manufacturer. Basically this product is an upgrade version of the successful Biota Bot MM208 for larger room, covers an area up to 860 sq ft.
Pre-filter – To remove larger particles like pet dander, hair and dust. True HEPA filter – A certified True HEPA filter always guarantee the effective removal of 99.7% of as small as 0.3 microns particles. Activated Charcoal filter – To combat with odors and smokes. Ionic filter – Instead of using UV-C Light filter like Biota Bot MM208, this new model will take use of an ionizer and can produce up to 10 million negative ions for your large room. Can be switched on/ off. As a high-end air purifier, Biota Bot MM608I is well-built and has many smart features like Smart sensor or filter replacement indicator. Related post: Best air purifier for mold. Review: Biota Bot MM608I Review. Previously in our list: Whirlpool WPPRO2000. 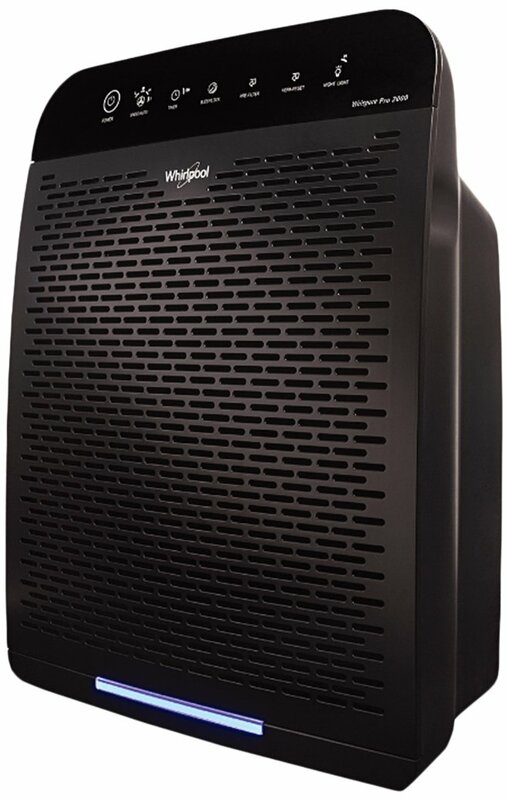 Whirlpool WPPRO2000 is the last one in Breathe Quality best large room air purifiers list. With 4 Fan Speed Settings, Whirlpool WPPRO2000 air purifier can cover up to 508 sq ft. This air purifier will come with a great CADR of 328 cfm and an ACH of 5X. Pre-filter – This pre-filter will trap large objects like dust, human hair, and pet hair. This pre-filter need to be cleaned regularly and replaced every three months. Activated Carbon Filter – This Activated Carbon filter traps odors and pre-cleans the air before it reaches the HEPA filter. True HEPA filter – A True HEPA Filter can reduce 99.97% of as small as 0.3 microns airborne particles. Out of the box, Whirlpool WPPRO 2000 will bring to you additional features like a Smart Screen Touch. This latest technology air purifier is also the only one you can find for Auto Air Quality Monitor within Whirlpool brand, to help you adjust the cleaning power for saving energy. The indicator for Air Quality Monitor has three colors: blue/yellow/red. On this page, you’ll find everything you need to quickly make the right decision on which top rated air purifier to get for your large room. The most useful buying guide we could give you is to check the area (large room coverage) your air purifier can cover. Because if you are using a 200 sq ft air purifier for a, well, 500 sq ft space, even in the best ACH (Air changes per hour) your air purifier still can’t purify your room air. The outcome is the reduction of your air purifier’s filter life time, as well as energy wasting. We guess you understand why you need to find the most suitable air purifier for your large room thoroughly, right? To ensure that your air purifier will work well, all you have to do is check the square footage rating of the device that you’re interested in buying. Then, compare it to the size of the room that you want to use it in. The device has a square footage rating that’s equal to (=) or greater than (>) the intended room size, then it’s a good choice. If not, DO NOT BUY THIS. If you need a complete buying guide for your large room air purifier, for example you want to know about the technical specifications like ACH, CADR, you can read more here. 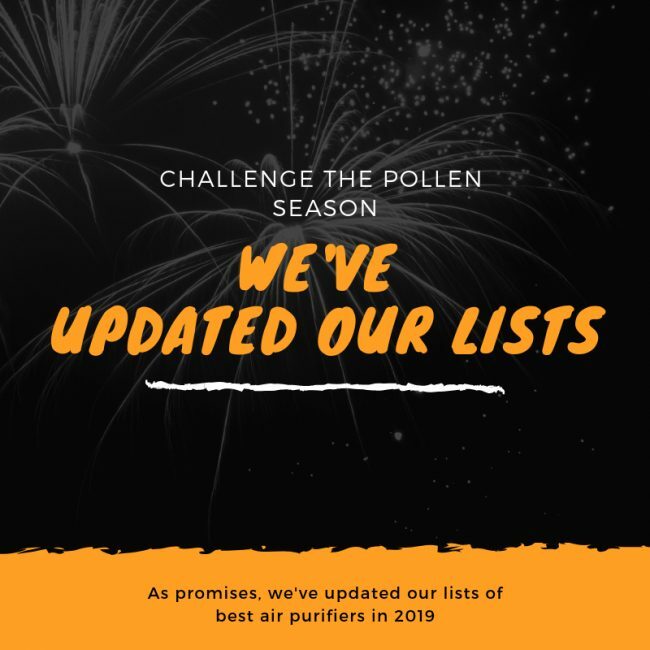 We hope our best large room air purifier list will help you choose your suitable air purifier in 2019. Thank you!